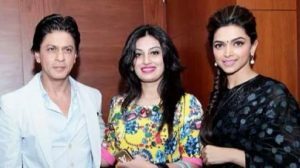 Bollywood’s King Khan, Shah Rukh Khan and actress Deepika Padukone attended an awards ceremony in Dubai and met Pakistani actress and model Farheen Iqbal. SRK and Deepika were all praises for Pakistan’s drama industry. According to reports, SRK praised Farheen’s work and offered her to work on his new project. Deepika congratulated Farheen on the success of Pakistan’s fashion industry and said that Pakistani dramas are loved by Indians. So, will Farheen accept SRK’s offer?